Donny Simmons makes bad guys cry — and kids laugh. 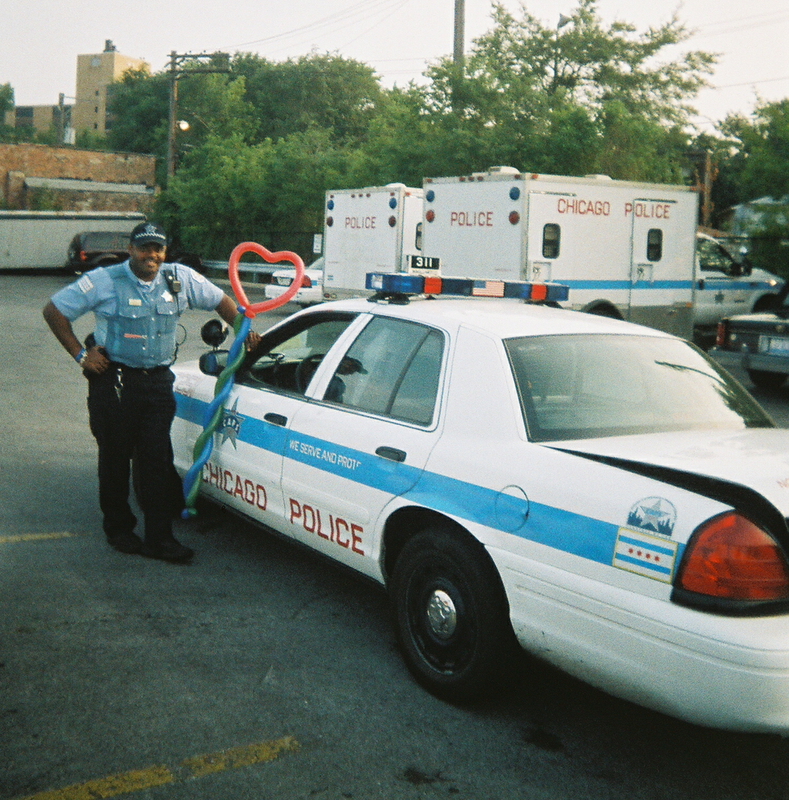 The longtime Chicago Police officer spends nights patrolling the streets of the Gold Coast. In his spare time, he transforms into Ding Dong the Hip-Hop Clown, working kids' birthday parties, block parties and even performing at Chicago Bulls games. The jobs "are so far apart, but the same in a lot of different ways," said Simmons, 41, describing both as "community service" positions. Simmons was raised in Englewood by a mom who was also a cop and a father who worked for the Chicago Fire Department. His aunt put herself through school with the cash she made from clowning, leading him to give it a whirl 23 years ago. Some of those laughing are his co-workers, who give him a lot of heat for his unusual side gig. “That kind of joking is part of police culture, but there are also of lot of officers that use him” for parties, said Simmons' partner on the beat, Roy Ariza. Simmons headed to perform at a recent block party after attending a funeral. A rainstorm moved his show into a dark, cramped garage where he set up a sound system between ladders and grills to pump in rap and house music. While thunder and lightning crackled outside, Simmons delighted a dozen children with comedy, magic and dances and made balloon sculptures. The jobs actually complement each other, Simmons said. “It’s two extremes, but each job helps me with the other,” Simmons said. When he first became Ding Dong, Simmons said he had a hard time turning down a child asking for one more balloon animal after the show was over. “Being an officer has helped me say, ‘I’m sorry, no,’” Simmons said. And the skills he’s developed working with children also have made him a better policeman. Ariza added: “Although I laughed when I first found out what he did, I soon saw that he’s more personable, and patient, and better at dealing with people than most of us." Working with kids also helps Simmons deal with the tension that comes with patrolling the streets, "which is pretty stressful," he said. Gold Coast Cop By Night, Hip Hop Clown By Appt.